We see the asking of questions modeled in our heroes of faith. Abraham asked, “Shall not the Judge of all the earth deal justly?” Moses asked, “What am I to do with these people?” Jeremiah asked, “Why does the way of the wicked prosper?” There are Job, Isaiah, King David… and Messiah Yeshua, who could be called the Greatest Questioner of all time, who in the Hebraic tradition, often answered questions with questions. Even G-d Himself has filled Scriptures with questions, inviting each one of us to join in the never ending dialogue between ourselves and our Creator. But what has happened to the art of asking a question? As a homeschool mom I look back on my daughter’s endless asking of “what?” and “what if?” and I rejoice at her “holy curiosity.”  It was my desire that my daughter would never outgrow her thirst for mysteries and the adventure of discovery; that unexpected conclusions and the delight of spontaneous learning would continue to be something fundamental to her perpetual learning as an adult. Sadly, that isn’t always the norm in our society. 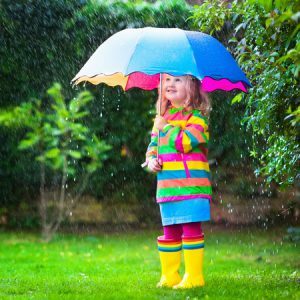 Too often we are rewarded for having the answer, not the question, and many of us lose that passionate wonder and curiosity of early childhood. 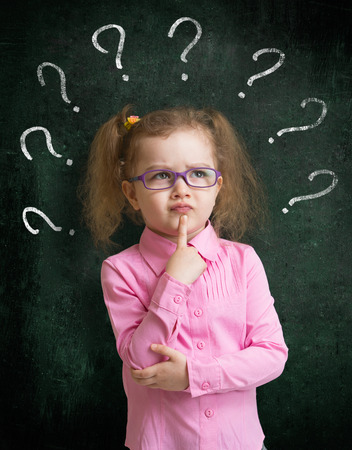 Albert Einstein understood the need to encourage curiosity in the hearts of every age, “Curiosity is a delicate little plant which, aside from stimulation, stands mainly in need of freedom.” And that freedom of curiosity is often expressed as a question. Yet, too often in our society the one with too many questions is sometimes considered a nuisance. What if I rode a beam of light across the universe? Albert Einstein asked countless questions as a child and it has been said that his teachers chastised him for a being a disturbance in the classroom. His own parents – though they loved him – worried that he wasn’t quite normal. Indeed beyond normal, Albert Einstein had an unquestionable thirst for the mysteries of the universe. Socrates who believed more in asking questions than merely conveying knowledge, was accused of corrupting the youth of Athens and sentenced to death. In my own personal Western-influenced experience, it took me time to truly flourish in the liminal space of a question. It meant letting go of my carefully formulated dogma, my preconceptions, of having to be right or wrong, of understanding true humility; because, inherent in a question is the fact that I do not have the answer. The challenge arises to move beyond fear, and to accept that my question would undoubtably usher in new questions. Over the years, G-d has fanned the flame of curiosity and wonder in my heart and every day I am excited by new “whys” and “what ifs” of my own and to the discovery that often my questions tell me more than the answer ever will. Rabbi Lawrence Kushner tells us: “It’s not that questions lead to answers, it’s what they do to the mind and soul [that’s important].” In Genesis G-d asked Adam, “Where are you?” G-d didn’t ask this question because he didn’t know where Adam was. He asked it to awaken something in Adam. The first mystery is simply that there is a Mystery. A Mystery that can never be explained or understood. Only encountered from time to time. Nothing is obvious. Everything conceals something else. The Torah doesn’t answer every question. The Rabbis understood this from the first word of Scripture – B’reishit – In the Beginning. The Rabbis asked the question, “Why was the world created with the letter bet (ב)? [One answer they gave is…] Just as the bet is closed on all sides but open at its front we don’t know what existed before Creation nor do we know what is above or what is below.”  Our quest for knowledge and understanding, therefore, should be focussed on what is before and ahead of us. There will be a time when G-d will wipe away every tear, fill every void, and answer every question. Until that time may we each have a holy curiosity that springs forth from the heart of G-d and is rooted in Truth. May each question we voice be for the sake of Heaven and may our souls throb with the wonder and awe of G-d, His Word, and His Creation. 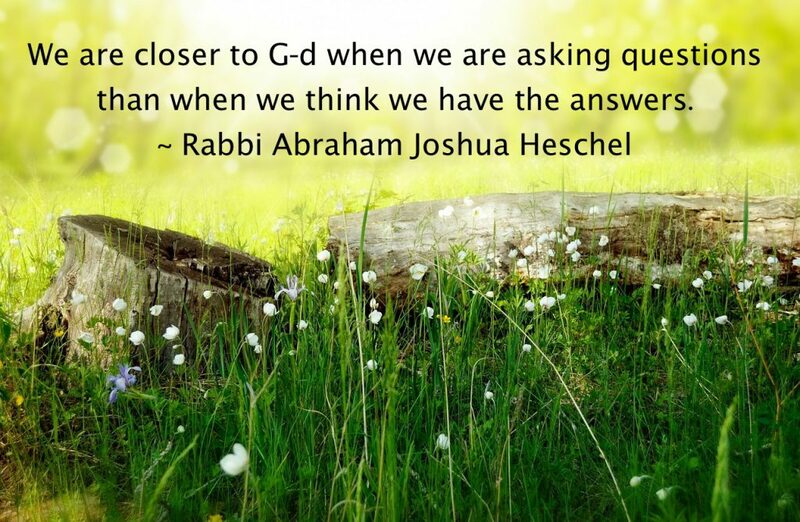 Just love Rabbi Abraham Joshua Heschel take on it “We are closer to G-d when we are asking questions than when we think we have the answers”….another profound statement and comforting to know!!!! My oh my Cindy, this is a wonderful collection of thoughts! I’m sorry I missed it in January, but loved reading it today. Thanks for sharing. Teresa I can so relate! Blessings to you.